How to enforce shoes removal in a lobby/house? My previous flat had a smaller and less open hallway, so that it was helping to enforce this rule even to guests. On the contrary, the new hallway is bigger and open to the living room and corridor. So there is a lack of guidance here, and people can spread everywhere. I live in a French city, and many of my guests are familiar with Japanese culture, at least peripherally through things like anime, manga and games. I'm keen to think that either living in a city doesn't entice people to remove their shoes, or that the small hallways don't help either once people have already entered the flat. How can I design my lobby/entrance so people are aware that removing shoes is requested? N.B. : I'm living in Europe where there is no such etiquette. Having something like this doormat outside your front door will 'permission prime' your guests on your expectations about shoe removal. Having your shoes on a shoe-rack on the inside of your flat will further reinforce your expectation. It is not uncommon to take your shoes off in Europe (at least in the UK and Belgium where I've lived). However, just sticking up a sign might be seen as rude / impersonal. If all else fails it's best just to ask people to take their shoes off. Assuming that your place is clean their shouldn't be any objections (unless they've got hole in their socks). As I commented, just wearing socks should often be enough (you could A/B test with colour/brightness for impact :)). Last week I was looking around a house to buy and we noticed that the owners weren't wearing shoes, so we automatically apologised and took our shoes off. So hopefully attentive guests should notice that you're not wearing shoes. You can line up your shoes that you've taken off by the door so that people notice the shoes. Something that is by the door is something that is typically taken off as you enter. People will be looking around at your hallway as they enter so they should spot them. 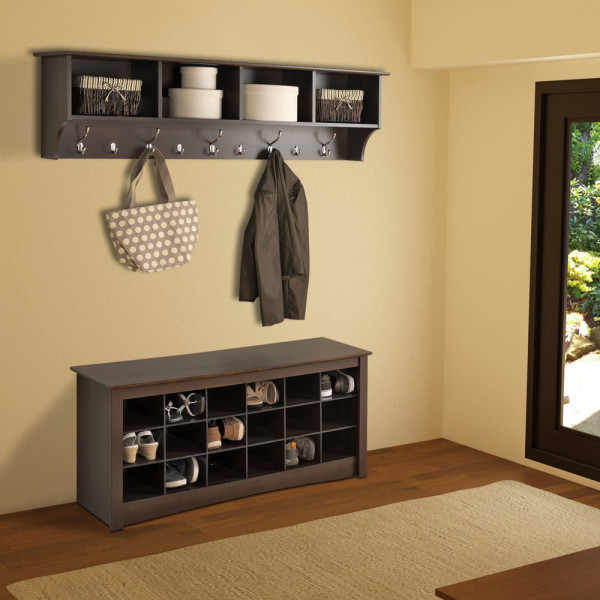 You can also have a shoe rack by the door with empty slots for them to put their shoes in. 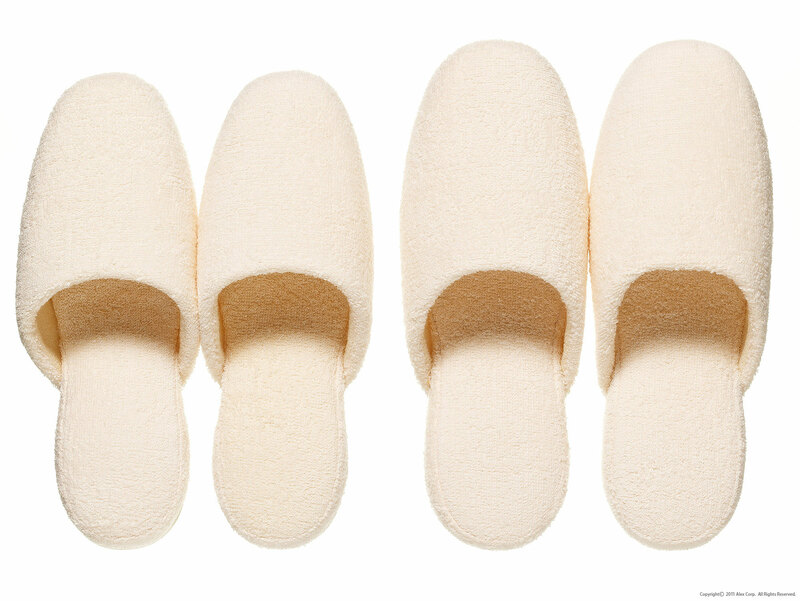 you could actually offer people (machine washable) slippers as I believe it is custom in Japan to do. This kind of makes something interesting about it - i.e. "we like to do things Japanese style here"
This also might avoid the problem of people having holes in their socks as they can just hide them inside the slippers. Hard floors also help as the difference in noise between you in socks / slippers vs the loudness of shoes should be noticeable. If you're having a party, you might have to be blunt and just ask people, hopefully the pile of shoes at the door from all the guests should be a clue to the later arrivals. 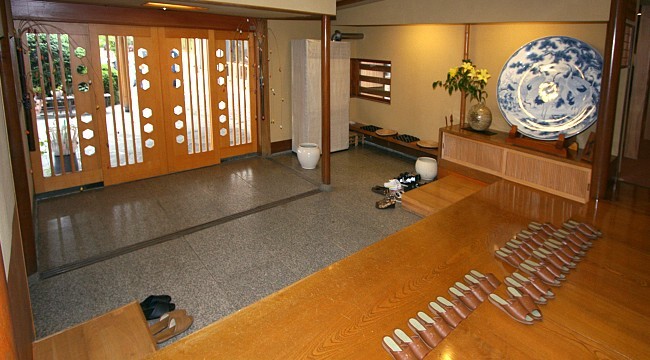 Also it seems that the common Japanese area where you remove your shoes is the 'genkan'. If you can make you're entrance look like that it should help even more. If you can add Japanese artwork to the walls that should also help. Of course you can ask people, and of course you can put up a sign, but this is a UX question, not a lifestyle/etiquette question. In an interaction design we wouldn't be happy putting up signs, or telling people how to behave: we want an environment that makes the desired behaviour automatic. 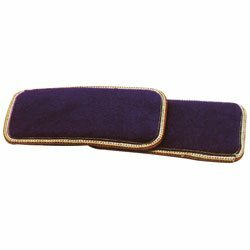 Cover your living room with deep, luxurious carpet. Keep this extremely clean. Fill your hallway with wet mud. Make sure to spray it with water just before the guests arrive, so they really sink into it. It's quite a length to go to, but short of pets and very absent-minded children, I can't think of anybody who would not be acutely aware of how dirty their feet are and looking around for at least a mat to wipe them. Of course, you do not provide a mat, but you do offer a little stool to sit down on, take your shoes off, and place them in a cabinet. We can use this bacic idea and make it less extreme (and a little less effective). For instance, you could tile your hallway with the exact same paving stones they have just outside your door. This still reminds visitors that they are in a shoe-zone. The important thing, again, is not to offer a mat. Don't give them any way to undirty their shoes and offer anything they need to take them off. Place extremely dirty shoes in their eyeline to reinforce the idea that shoes are dirty. Place little slippers just over the threshold to reinforce the idea, and make it inviting. Have a pair of flip-flops or sandals that you put on for entering the hallway, so that the rule goes both ways: no socks in the hallway, no shoes in the living room. I should note that if you actually do this people will think you are mad and stop visiting anyway, but if you really want to nudge people, this should be the most effective method. Start with subtle clues, slowly becoming more direct. As is commonly advised to writers; show, don't tell. People like making decisions on their own, but they also generally want to make others feel good. And especially in new environments and situations, we mimic. It's all about gradually going from subliminal cues to explicitly stating the intended outcome. 1 - Take off your own shoes. If you're bringing guests to your home, take off your shoes first, and then your coat after. This gives your guests the time to see that you're taking your shoes off, and they can follow suit. People generally take off their coats first and then their shoes, so it might feel weird to do this order, but it also draws extra attention to the act. If you're already at home wearing nothing but socks (well, hopefully a bit more..) you can't really take off your shoes, so skip this bit. Like others mentioned, having a shoe rack would be very beneficial. People see they that shoes are kept near the door, so they're likely put on/off near the door. They can then infer that they should do something with their shoes after using the door. As they're currently wearing shoes, the logical option is to take them off. If you're not sure they've seen the rack, or if they're not preparing to take off their shoes, point the rack out, in a non-intrusive way. "The coatrack is there, and you can put your shoes underneath"
This way they definitely know where to put their shoes if they decide to take them off. You're implying a link between hanging up a coat and taking off shoes. They're currently taking off coats, so perhaps take off the shoes too? The phrasing here is important. When you say "you can do X" it still leaves the decision up to the guest. You're not telling them to do X, you're assuming they want to do X, and helping them do it. it's supportive and guiding, not instructive and authoritarian. 4 - Outright ask them. But be kind. When they don't get any of the clues, ask them if they want to take of their shoes. Don't tell, ask. "would you mind taking off your shoes? I like to keep the house clean." It's still not authoritarian, but a request, still technically leaving the choice with your guest. But if they're nice people, they'll comply. Because they're visiting your house, they'll likely act nice. They're probably there to connect closer with you, which doesn't work if they frustrate you. Second, it's your house, your rules, at least that's the social contract in most cultures. 5 - Put your foot down. Oy bruv take them trainers off before I knock you in the gabber. I'mma screw you right up mate, loose the boots. Respect my authoritah! I kid, I kid. Don't actually get aggressive. 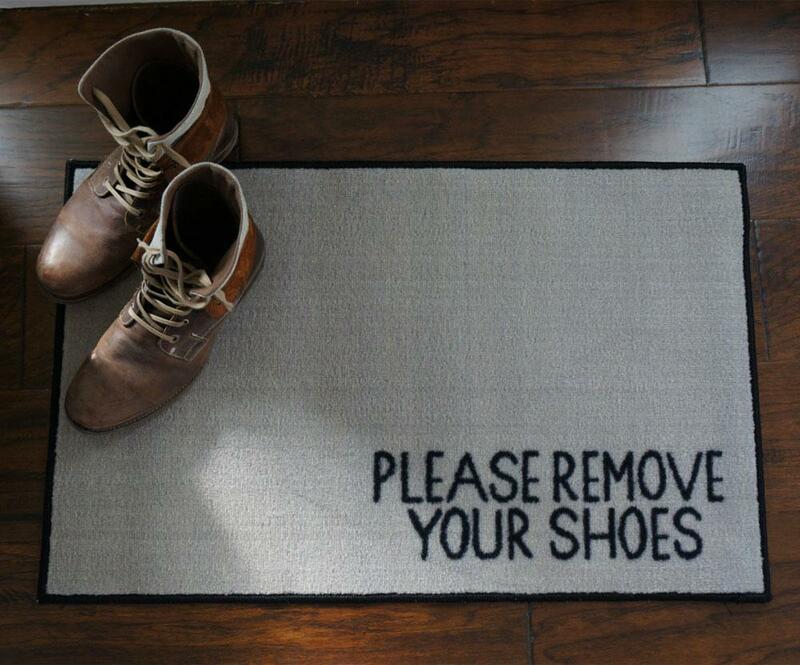 Here in the UK many expect shoes to come off at the door and visitors will ask if they should remove them. We change from shoes to slippers as soon as we get home. We have an area in our entrance with a Bench so everyone can sit and easily remove shoes. I have found that it's best to be open and keep things simple. If people don't ask them we just say that we don't wear shoes in the house and could they please take them off. Guest slippers would not work here, and I wouldn't wear them when visiting. We advise people that we are a shoes off house and ask they bring slippers or socks. Taking shoes off is second nature for me but not everyone was brought up to do it . i can't imagine wearing shoes in the house or on someone's lovely carpets. Why not just ask your guests to take off their shoes as they come in? Unlike a sign, it can't be interpreted as being pushy. At least in my experience, I've never felt that someone asking me to take off my shoes is being uptight, and I've never seen or heard of someone being annoyed by being asked to take off their shoes. I don't think I would pick up the hint if you had a shoe rack or were wearing brightly colored socks. Instead of thinking, "I should put my shoes in the rack," or, "I should be in socks myself," I would think, "Édouard Lopez uses a shoe rack and likes to wear brightly colored socks. Good for him, and I'll do what I'm comfortable with." Asking people to take off their shoes is direct, polite, and impossible to misinterpret. There really isn't any UI magic in this answer. But I think maybe the simplest answer is best in this particular case. Set a white, clean blanket in the floor, and leave your shoes (a couple pairs) just before stepping on it as a demonstration. This should make your visitors worry about stepping on such a clean surface and imagine the solution. Anyway, be ready to handle cases of people that will not understand without getting upset. As I can't comment, I had to answer as a solution. As a French, I would also suggest to just tell people right away if you don't see them taking their shoes off as some people can miss cues, as Alex has suggested. And you can be pretty blunt about it. While Pharap is right that you can be more engaging, you can also be very direct with French people (1) we don't consider that as rude, I am living in the UK at the moment and I am well aware that directness can be perceived as rude, but not particularly by most in France. Oddly, I would personally perceive the sign/doormat proposed by Midas as rude. I would not mind it too much if you are a teacher or a health worker or such a profession that you are used to give orders to people all the time (as I would see that as a by-product of your profession, but then I would also consider that you are a pretty rigid person or you have a weird sense of humour). BTW, it is pretty common in France to not wear shoes at home - that is the case of most of my friends living in flats. However, the guest policy can be a little bit more flexible. In houses, it is a little bit more fuzzy as well. Most of the newer constructions are usually divided into a 'day' and a 'night' part. And a lot of people (but not all) would allow their guests to keep their shoes on as long as the guests stay in the day part. This said, not wearing shoes yourself, should be a great cue by itself. Having some shoes in the entrance and slippers will also be another cue. If you are fond of carpet, one with longer threads and with light tones should bring 80% of your guests ask you if you want them to take their shoes off. One main reason, that some people might try to play dumb would be that they might be ashamed of showing their feet or socks. If you have slippers around that should not be a problem anymore. Basically, you keep your shoes, but you need to keep them on those 'patins'. I find them very annoying and I usually ask if I can take my shoes off and sometimes I am answered by the host that they prefer me to keep the shoes and the patins. (1) However, they would be some categories of people that as a French you wouldn't really ask to take their shoes off if you don't already have a close relationship: these people would include older people, particularly the parents and grand-parents of your girlfriend/boyfriend, your boss and their family. Nonetheless, most of them would propose themselves to take their shoes off. My home is a shoe-free zone as well. Our family uses a shoe rack and our guests typically leave their shoes in a pile next to whatever shoes we used that day. Whenever we'll having groups of people over we tell them in advance, "...oh and by the way we're a shoe-free home just so you're not thrown off we when you see the big pile of shoes by the door". I'd give a try of placing a shoe cabinet straight against the door (of the hallway size allows that, of course) so that you'd have to pass by its side on entrance. In this case, the shoe cabinet would act as a barrier on the entry and would naturally remind of itself by stopping the natural pathway course. Not the answer you're looking for? Browse other questions tagged design social-interfaces architecture or ask your own question. How to indicate the word “interesting” with an icon? How to leverage team effects in HCI? How important is it to provide a distinction in your model? How can we call the UI discussion pattern on Google+ or Facebook? Is it a chat? How do people use Google+ circles? How should one refer to their social network profiles in prints? How does the YouTube 2014 voting system work? How should a chronological activity feed behave? How should I handle pending follow requests when the profile privacy level changes?